Hi! My name is keiara and I create all the beads and jewellery for by keiara. 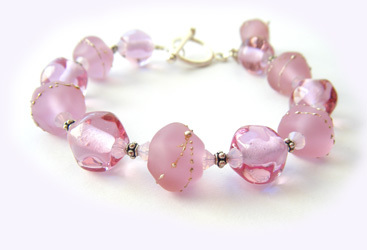 Each lovely glass bead is handmade with the utmost care and attention to detail. I use Effetre, Creation is Messy, Reichenbach and other 'soft' glass to create wearable art. I was born and raised in Florida and moved to England in 2005. Back home I was in the legal field so I was faced with a dilemma: learn my trade all over again or take advantage of my position as a housewife to do something I've always wanted to do. I'm sure you can guess which path I chose! It wasn't long before I discovered lampwork beads and fell in love with lampworking as well. I enjoy making beads and that is my main focus these days. I still create custom jewellery so please feel free to ask about placing an order! I love learning new techniques and exploring new methods of expressing myself through my art. I truly love what I do!